A group of volunteers from the Saskatchewan Indian Gaming Authority (SIGA) brings a group of volunteers on the third Thursday of every month. They come in their bright red matching t-shirts and SIGA aprons. The group lends a hand serving the lunch meal. SIGA has also provided a grant to sponsor the meals on the day they come to volunteer. Any business, individual or family can sponsor a meal. It’s a great way to donate in memory of a loved one or celebrate a special event. Volunteering at the meal which is sponsored is encouraged, since it’s a great way to connect with the community. 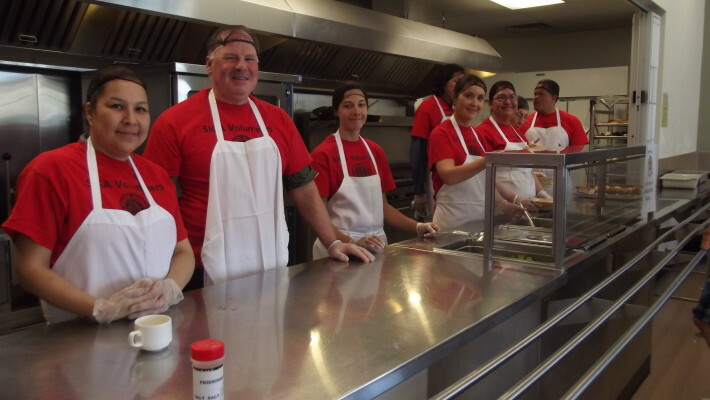 Thank you to all the different SIGA employees who come to volunteer at the Inn!